I cooked this sweet and sour pork (kulo yoke) for my family's dinner before driving back to my hometown for Chinese New Year Celebration. This is one of my children favourite dish and I am sure your kids love this dish too. I prepared this tomato sauce using minced pork meat. You can just coat them with corn flour or any fried chicken flour before deep frying them. If you want the meat to have more flavours, you can use this Mini Pork Balls recipe that I posted previously. 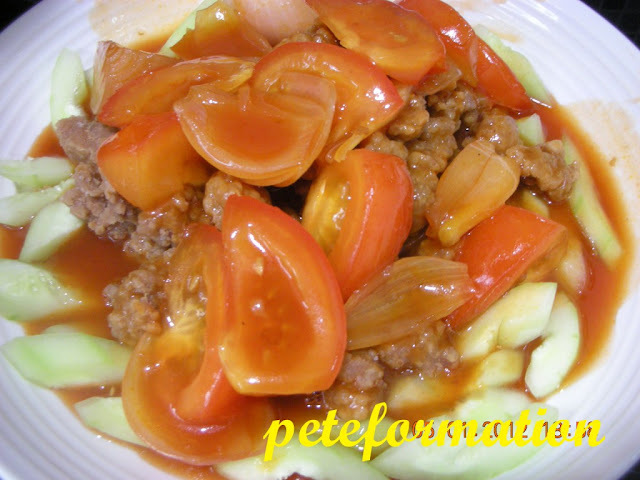 Here is my Sweet and Sour Pork recipe (Pork in tomato sauce). Coat minced pork with corn flour and deep fry them until golden brown. Put the deep fried pork aside. Heat up wok and pour in a little vegetable oil. Saute garlic until fragrant. Add a little water, tomato sauce, onion, bell pepper, salt and sugar. Bring to a boil. Arrange the deep fried pork and cucumber on a serving dish. Pour the sauce over the deep fried pork and cucumber. Serve while still hot. Best eaten with steamed rice. Yumz yumz kulo yoke~ My favourite! My kids' favourite dish. Thanks for the recipe, I sure try out one day. My favourite dish all time! Wow! I love ku lo yuk! So yummy!!! kids love these! so do I!! Mmmm....one of my favourites. It's a long time I have not cooked. I must cook this again. I usually use chicken. Hope you have great new yr.
Gong Xi Fa Cai! I supposed you too have a wonderful Pai Tin Kong ^_^ great idea to use minced pork for this , easy for kids to eat.